I must have had so much energy in week two. 9 blocks in 8 days! Woo… I wish I still had that energy. Therefore, I will be doing this week’s tutorial in two parts. I will be going over Walls of Jericho variation (closest one I could find to that. I will update the name once I find out it’s true name. If you know the name, please let me know), Balkan Puzzle, and Inverted Star. This first one I found only as a picture on Flickr. So I had to make up my own pattern estimates. Another great scrap buster BTW. HINT: I love to use graph paper. Mine has 1/4″ squares borders with bolder lines for every square inch. You may find this handy if you need your blocks to be a different size. You can convert this one to a 16 patch to resize it accordingly. Various colored fabric (not close to the color of your tilted frame): Forty eight 1 1/2″ squares. This will be WAY easier than making a few HSTs. BUT if you insist, cut sixteen 1 7/8″ HSTs and only cut 32 squares. 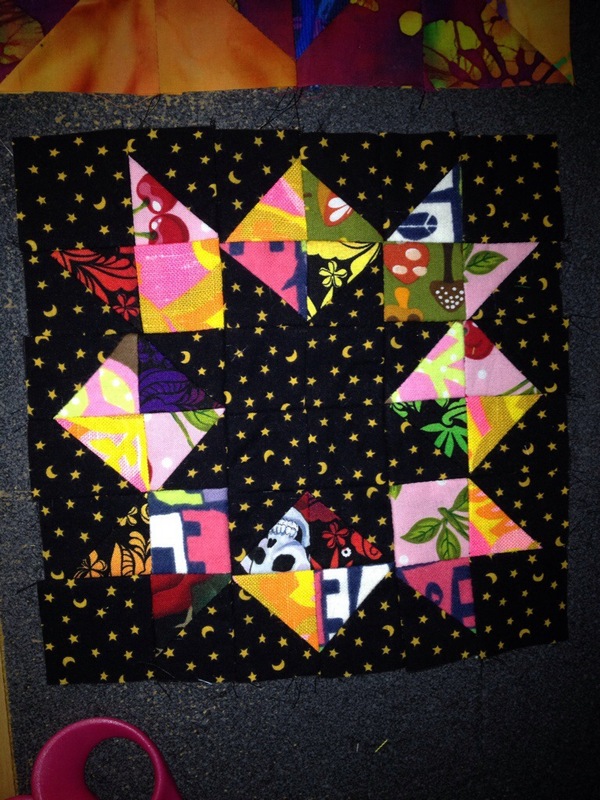 Tilted Frame Fabric: Eight 2 1/2″ squares. Sew two small squares to two caddy corner corners (hehehe) of the bigger squares on its’ diagonal to make an HST on the two corners. Press! 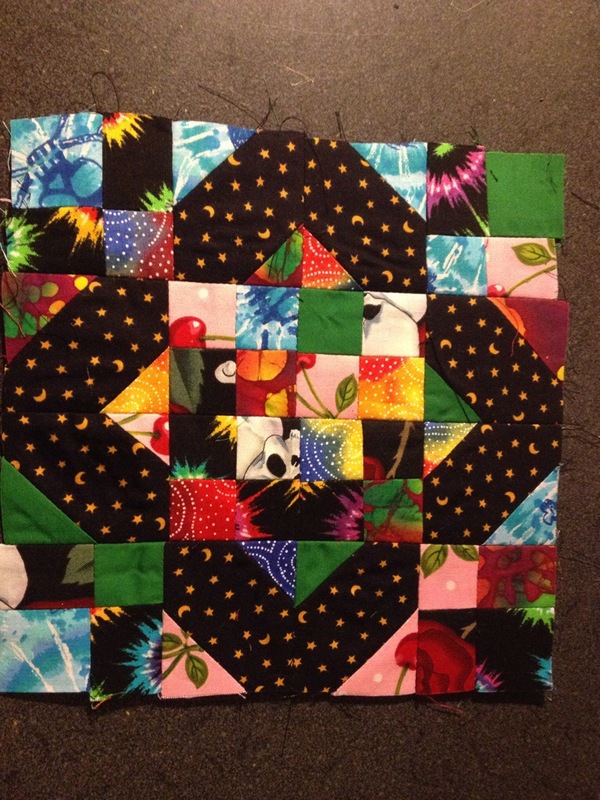 Then sew four patches of the various colored squares. Press! 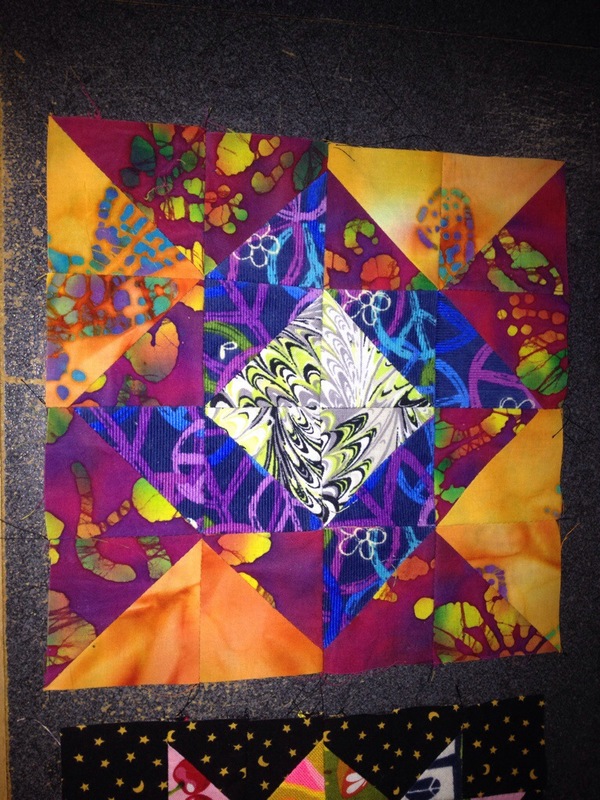 Assemble the block in 4 rows and sew those together! Press! I got this one from Chock-A-Block Quilt Blocks. I resized it to fit my needs. This is another 16 patch. This is made of all HSTs. But I used squares and saved the trimmings for future smaller HSTs. You will see these used in another block. Four colors are used for the 2 1/2″ squares. Sew the squares together (according to the pattern’s order) on their diagonal, trim off the excess. Press. Sew the four rows together. Press. This one I also found on Pinterest. Who am I kidding, most of these are on Pinterest. The Inverted Star is a 6 patch. So it was a little more difficult to convert to an 8″ square. You can come close to the 8″ by using 1 7/8″ squares if you use a 1/4″ seam. I think I used a 3/8″ seam and made them 2″ each. ALSO, I made the mistake of not using opposite colors from the darker fabric. This resulted in the pattern not truly showing unless you look really close, IMHO.